Some of our customers, keen on our olive oil, started to demand us to select other nice Spanish organic products to complement our olive oil. This is why we are carefully selecting delicious products, as vinegars, table olives, olives tapenade, dried tomato dressed with olive oil and jams. Our products follow an strict quality control by HACCP internal system, guarantying perfect sterilization and seal, and are certified organic according to European Union organic regulation. Organic whole green olives, dressed with vinegar, garlic, herbs (fennel, thyme, bay leaf) and sea salt. 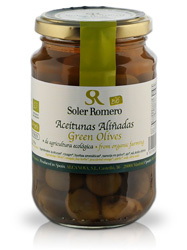 Two varieties: green or black olives tapenades, made with organic olives, extra virgin olive oil, sea salt and herbs. 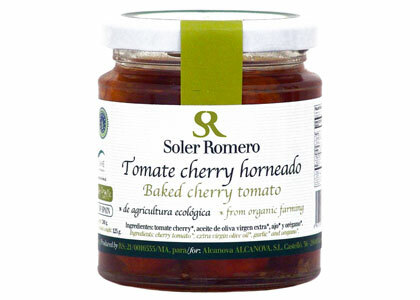 Our tomatoes have been cultivated in sunny Andalusia following organic agriculture standards. 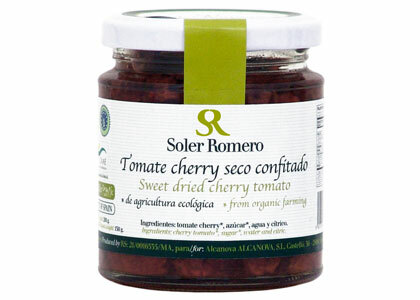 These tomatoes, carefully selected for their quality of taste, are lightly and slowly dried by sun and special ovens. This method allows them to preserve all their aromas and to develop exceptional fruity notes and a nice texture. These delicious tomatoes are the main ingredient of our three preserves, very new products; delicatessen lovers and culinary professionals are keen on these three unique products, their last discovery. 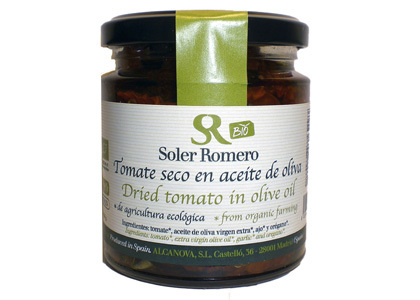 Organic dried half-tomatoes in Soler- Romero EVOO, garlic, oregano and salt. Delicious organic dried dehydrated tomatoes cut in halves and seasoned with spices and our organic extra virgin olive oil. Organic baked cherry tomatoes preserved in organic extra virgin olive oil (from Soler Romero mill) and dressed with garlic, oregano and salt. Their texture, between the fresh tomato and the dried one (they are not completely dried), is a delightful surprise for your palate. Taste them plain for an aperitif, use them in salads, pasta, sauces or serve with cheese or grilled meat. Ingredients (from organic farming): baked tomatoes, extra virgin olive oil, garlic, oregano and salt. Organic Sweet dried tomatoes. Tomatoes are dried in ovens until they get dehydrated. Natural sweetness of varieties is enhanced with organic sugar, becoming splendid rich sweet dried tomatoes. Tasting and appearing similar to raisins, they are excellent snacks, and original and tasteful ingredient in salads, pies, cheese recipes and desserts. Ingredients (from organic farming): dried tomatoes, organic sugar, citric and water. Selection of the finest tasty organic fruit at the right ripeness and careful elaboration process are the key of our jams and marmalades. While still fresh, after few hours of picking, fruits are hand pealed and prepared for jams´elaboration. No sugar is added to our jams or marmalades, only organic agave syrup (30%) is blended with the fruit (70%). In our range, you can find three delicious varieties: orange marmalade, mandarin marmalade and fig jam. Tasting as all fruit jams should taste... bites of fruit.